Bobby Curtis' odds of making the USA Olympic team just took a bit of a hit as a result of the Olympic Marathon Trials last weekend. One prominent competitor at those Trials -- Dathan Ritzenhein -- finished 4th and off the Olympic team. Ritzenhein will now enter the fray at the 10,000 meters at this summer's track and field Trials, thereby adding another formidable competitor standing in the way of Bobby Curtis' quest to make the team. Indeed, Ritzenhein seems to have now drawn the conclusion that the marathon is not his optimal distance and that he's really best suited for the 10,000 meter distance. Curtis need not have worried very much about Meb Keflezighi or Abdi Abdirahman at the 10,000 meter distance (both made the marathon team), and Ryan Hall was as sure a bet to make the team as anyone in recent years. It was precisely Dathan Ritzenhein (married, by the way, to former Villanova distance runner Kalin Toedebusch) who posed a 10,000 meter threat to Curtis' bid, and it was therefore best for Curtis's own chances for Ritzenhein to make the marathon team, keeping hinm out of the mix at 10,000 meters. As it stands now, Curtis will have to finish in the top three at the Trials in a field that is composed of such figures as AR holder Galen Rupp, form AR holder Chris Solinsky, Dathan Ritzenhein, Matt Tegenkamp, Scotty Bauhs, and others. Rupp, Tegenkamp, and Bauhs all beat Curtis at the 2011 USATF championships, knocking him off of the USA World Championships team, and that race did not include either Solinsky or Ritzenhein. Adding more worries is the fact that Curtis is rehabing a foot injury which forced him to scratch out of two high-profile races over the past month (in Italy and Scotland) and to put his European training and racing plans on hold. 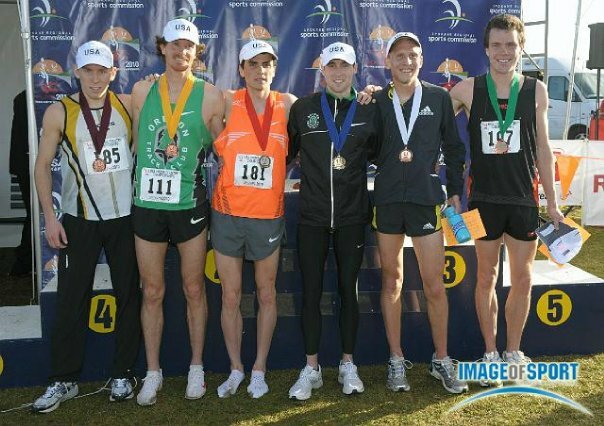 Curtis had the second-fastest 10,000 meter time among Americans in 2011, but was 4th at Nationals. He needs to run his perfect 2012 race at the Trails (and not at an early season meet such as Stanford or Mt Sac) if he wants to make the 2012 Olympic team. Ritzenhein's 10,000 meter PR is 27:22.28, two seconds faster than Curtis' 27:24.67. Adding him to the 10,00 meter mix means that there is one more top competitor who must be beaten. Prior to Saturday’s U.S. Olympic Trials Marathon, I was secretly rooting for Dathan Ritzenhein not to finish in the top three and not qualify for his third Olympic team. Why? Not for any sort of malicious reason but because I felt he would be better off in the 10,000 meters rather than in the marathon. Ironically, the race in Houston showed exactly why the 10k distance fits Ritzenhein the best and why the marathon may not be his strongest event. Ritzenhein has struggled to master the marathon despite five previous attempts at the distance. Earlier on, it had to do with leg cramps and other fueling challenges that hampered him at his debut in New York City in 2006 and at the Beijing Olympics. Despite difficulties with the marathon, Ritzenhein has continually stuck with the event, perhaps due to outside pressure to succeed in the event. Americans have always been entrenched with the marathon going back to Olympic gold medals claimed by Frank Shorter in 1972 and Joan Benoit in 1984. Despite a lull throughout the late 1980′s and 1990′s, the thirst for success at the 26.2 mile distance was reborn when Meb Keflezighi and Deena Kastor each won medals at the 2004 Athens Games. It’s clear that the U.S. obsession with the marathon had something to do with Ritzenhein’s decision to stick with the event. On Saturday, different problems arose – hamstring spasms that forced him to drop from the lead pack. A series of slower miles in the 5:10′s that followed put Ritzenhein out of contention for the coveted top three spots. The vent up frustration finally caused Ritzenhein to admit the 26.2 mile distance may not be for him. “Maybe I’m forcing it. Everybody wants me to be a marathoner and I want to be a marathoner but maybe it’s not in the cards [right now],” Ritzenhein told reporters shortly after finishing in Houston. I agree. A forced return to the shorter distances is a good thing for Ritzenhein. After all, this is a man who showed prodigal talent on the track at a young age, running 13:44.70 for 5k shortly after graduating high school and setting the NCAA record of 27:38.50 in the 10k while at the University of Colorado. Ritzenhein experienced a bit of a lull in his career with the marathon as his focus from 2006 to 2009 but used the endurance gained in those years to have a spectacular summer and fall of 2009 when he set the American record at 5000 meters and claimed a medal at the World Half Marathon Championships. In the end, the 10k is the event that best complements Ritzenhein’s strengths at the moment and gives him the best chance at reaching the Olympic podium in London. Barring injury, Ritzenhein will have much more time to prepare for the Olympic Trials in late June than he did for the marathon due to three surgeries in early 2011 that forced him into a limited training cycle. Ritzenhein will also have the added benefit to pairing with his training partners leading up to the Trials. Prior to Houston, his marathon preparations did not coincide much with the training of fellow Nike Oregon Project members Mo Farah and Galen Rupp who were coming off their break from the track season. This spring, Ritzenhein will have the advantage of doing full training with his teammates under the watchful eye of coach Alberto Salazar. Plus, Ritzenhein in the 10k provides more drama for fans. Imagine the last mile in the 10,000 meters at the Olympic Trials with Ritzenhein, Rupp and Chris Solinsky duking it out for the national title before heading off to London and taking on the world’s best on the biggest stage in track and field.